Classical Copywork has Patriotic Copywork for download for just $2! In this copywork pack you will find The Pledge of Allegiance, The Star Spangled Banner, America the Beautiful, My Country ‘Tis of Thee, The Preamble to the Constitution, God Bless America, The Mayflower Compact,and the beginning of the Declaration of Independance. Each page is typed clearly for your beginning reader/writer to easily follow and has ruled lines directly underneath to easily copy. 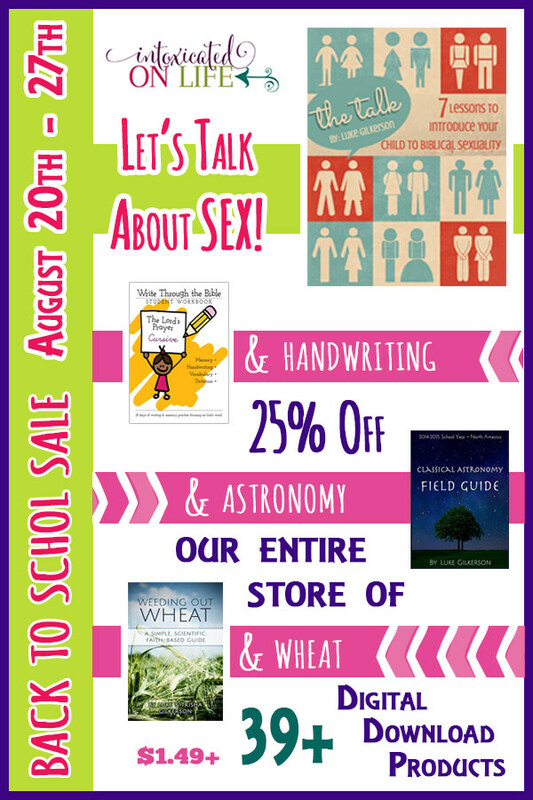 Back to School Sale at Intoxicated on Life! Right now you can save 25% at Intoxicated on Life’s Back to School Sale! The entire store is on sale!! THE DISCOUNT WILL BE APPLIED AFTER YOU HAVE PUT ITEMS INTO YOUR CART. 25% WILL BE APPLIED TO YOUR ENTIRE ORDER. Author Karen DeBeusPosted on August 20, 2014 August 25, 2014 Categories Bible Study, Budget FriendlyLeave a comment on Back to School Sale at Intoxicated on Life! Looking for Bible based copywork for the new school year? Check out Intoxicated on Life! They have manuscript and cursive available at reasonable prices! There are several books available- head over and check it out! Don’t miss Educents Back to School Curriculum Blow Out Sale going on right now! Bible: Our study will consist of Acts and Romans. We will tie this into our history studies as well. We will go through the book of Acts and read commentaries, listen to sermons, etc. as we go. I am also planning on having the older kids write out a book of the Bible at a time into a notebook. We will probably start with Acts since that is what we are studying. Geography: We will study the geography of the lands that we are reading about in Acts and Mystery of History, but I also want to once a week review countries, continents, oceans, and states and capitals with my olders, and start teaching them to the kindergartner. I don’t have anything formal for this, except books, maps, etc. Science: Apologia. The younger children will be finishing Exploring Creation with Physics and Chemistry. We started last year and took a slow pace. The kindergartner will listen in, and he will also explore his world outdoors- science will be informal for him. My 8th grader will do Apologia’s Physical Science for middle school. Language Arts: IEW for the 8th grader- another review coming on this in the fall 🙂 My younger boys will be doing Language Lessons from Queen Homeschool. The kindergartner will be doing Explode the Code and learning to read. Penmanship and Spelling– Print to Cursive Proverbs Copywork from Simply Charlotte Mason for my 4th and 6th grader. They will also continue with Spelling Wisdom from Simply Charlotte Mason. Literature: Family Read Alouds and Individual Reading: various, I am working on book lists. Fine Arts- Lots of music, dance, drama, and computer art classes at a local fine arts program for all grades. Right now my book Simply Homeschool 2nd edition is available in paperback as well as Kindle! Compass Classroom has all of their video curriculum UP TO 50% off right now! Don’t miss the Back to School Blow Out Sale at Educents! 72% off Preschool Curriculum Bundle at Educents! Right now you can save 72% on this Preschool Curriculum Bundle at Educents! Author Karen DeBeusPosted on July 30, 2014 Categories Budget Friendly, PreschoolLeave a comment on 72% off Preschool Curriculum Bundle at Educents!